All wild anthuriums are naturally rain forest species, but few actually spend their entire lives growing with their roots in soil. Most typically enjoy an epiphytic lifestyle in trees, either dwelling within the canopies or creeping up the trunks. Anthuriums common to the house plant trade are usually hybridized forms of Anthurium andreanum, are often referred to as flamingo lilies, and are native to Colombia and Ecuador. The anthurium enthusiast should keep one idea firmly in mind when caring for these plants--"hot, humid rain forest." Create a loose, well-draining, jungle-like growing mix, starting with about 50 percent high-quality, moisture-control potting soil. The other 50 percent should contain equal parts orchid potting mix with hardwood, perlite and peat moss. Combine all ingredients well, and add a little organic compost and aquarium or horticultural charcoal if you have it. Plant your anthurium in a clay pot with the jungle mix at the same depth it occupied in the growing container. Clay pots allow roots to breathe, and facilitate drainage better than those made of other materials. Scatter some pebbles or coarse gravel in the bottom of a shallow tray and cover them halfway with water. Set the potted anthurium on top of the gravel. Don’t allow the bottom of the pot to come in contact with the water. This will increase the humidity available to the plant. 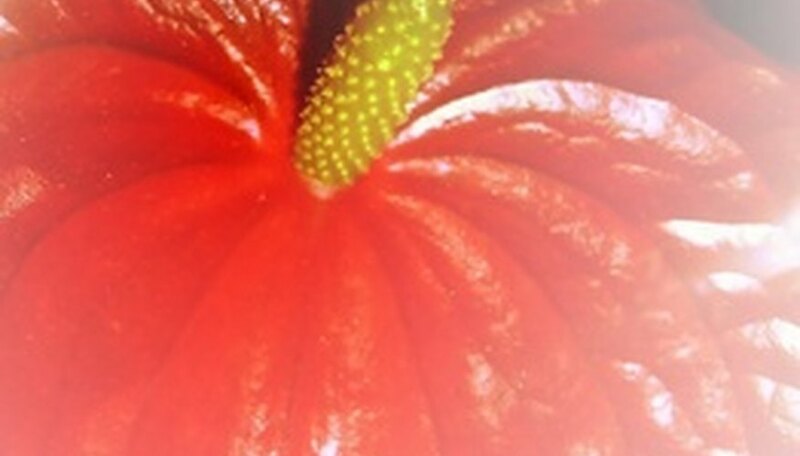 Place your anthurium in the strongest filtered or diffused natural light possible. While these plants will survive in lower or artificially lit conditions, they won’t be very happy. Provide a warm environment with good air circulation for your rain forest native. Ideal temperature range is between 70 and 85 degrees F. Don’t expose it to extremes below 55 F or above 90 F.
Water your anthurium enough to keep the surface soil evenly moist, but never soggy or wet. The roots of these plants need to be allowed to breathe freely, moistened often and drained quickly. Mist daily during the growing season. Feed a water-soluble liquid fertilizer mixed at quarter strength once weekly during the growing season. Follow the packaging instructions carefully. Move your anthurium outside to enjoy natural filtered light whenever weather permits. They’re particularly fond of spending leisurely hours beneath the canopy of a shade tree.